: The Night of Shiva is one of the most important hindu religious festival celebration in India. The Shivaratri festival is celebrating in 14th night of the new moon in the month of Phalgun which is falling on the month of February – March in English Calendar. The literal meaning of Shivaratri is “the night of Shiva” devotees believe that Lord Shiva was tied in knot with Parvati, on the auspicious day of Shivratri. During shivarathri, special arts and devotional programmes are organised in the Siva temples on all over the country. Maha Shivratri is celebrated on the night of the 14th day of Krishna Paksha of Falgun as per the hindu calendar. 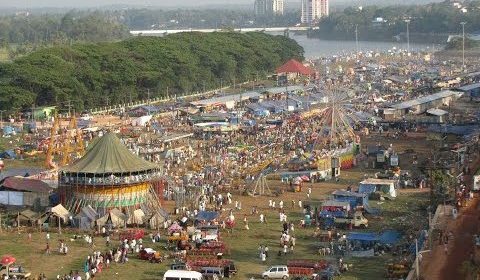 Aluva manappuram is the most famous location in kerala to celebrate shivaratri in Kerala. Aluva shivaratri is celebrated at the Aluva siva temple on the banks of Periyar River in Aluva (Manalpuram). Many thousands of devotees are visiting the Maha Deva temple in Aluva Manappuram and take part of the Shivaratri festival. Maha Shivratri 2019 fall in the day of March 4th, Monday this year.